OThis week (and possibly at secret locations), top officers and officials from ALA meet with publishing companies Simon & Schuster, Macmillan, Penguin, and Random House publishers in New York City. The announcement of these meetings has moved me to a place of cautious cynicism. As much as I had previously hoped for publishers to meet with the library community, I’m sketchy as to the possible results and benefits from these gatherings. The ALA’s list of demands starts off with a demand for publishers to listen to their demands and (I love this part) “deal with libraries and […] do this as soon as possible”. I’m unsure as to the origin of this Jack Bauer sense of urgency; libraries have already missed the eBook train. (And by missed, I mean “kept off of it”.) While some might see this as a time for catching up, I’d be more interested in what it would take to catch up as well as the terms associated. More than likely, if current eBook licensing arrangements are any indication, it could have the makings of a pill that is too bitter to swallow. Publishers, for their part, aren’t in much of a better talking position. If they are counting on brick-and-mortar stores like Barnes and Noble to be their saviors, then libraries are a natural second choice for physical locations that supply books to a population. But, since we lend materials (and lending is a codeword for “lost sale”, no matter if a person patiently waits three months to read a book), this presents a unusual hesitance for allowing the lending eBooks to libraries. Coupled with the fact that they have “new concerns about the security of our digital editions”, this might be a starting stalemate for any meetings. Personally, I would *love* to hear any and all explanations given to this latter point. So, a person who downloads an eBook directly from Amazon or Barnes & Nobles is not a threat, but someone who is required to installs Adobe Digital Editions, make an account with Adobe, then use their library card through the library’s website is a threat? How different is the file in these cases that makes one a problem and the other not? Simply put, this won’t be a “Come to Jesus” moment for publishers nor will it be a breakthrough for less restrictive library eBook lending. I’d like to imagine that these meetings would be productive, but I think that the only thing they will produce are press releases about their productivity. LISNews had this interesting article on the death of the First Sale Doctrine in the digital age. In rebuking ownership and proclaiming that the software, music, movies, books, and so forth are licensed, leased, or rented, people are denied the right to transfer (and for the specific purposes of this post, lend or give) a copyrighted work from themselves to another. While I will concede that my support for the establishment of First Sale Doctrine rights for digital property has major problems when it comes to how to transfer ownership, I can’t help but wonder if the elimination of ownership (or even the ability to lend or give) is a good thing or a bad thing. My first reaction to the article was the immediate difference between purchasing and (in effect) renting. In disallowing ownership and some of the stakeholdership associated with it, does it transform our notions of pop culture into a transitory or disposable one? (Considering how quickly music groups and movies fly through our lives, perhaps this is a late discovery.) As much as companies might feel that lending is a lost sale, is this better than having people with no actual investment in a media or medium and treating it as such? Without ownership ties, does this effect how easily or readily people might give up on a band, book, or movie? I can’t help but feel like it does. Following this, all I could imagine is what the management of digital rights must cost the industries involved and what it would be in perpetuity. As the number of works increases, it will involve managing those copyrights and their associated trademarks and brands. Considering the length of copyright protecting, this means that someone will have to be placed into the role of the ever vigilant observer to ensure these rights are protected till they expire. (Perhaps there can be some sort of pseudo-religious order founded on the basis of protecting copyrights since it’s going to take several generations of keepers to safeguards. Like the Knights Templar of Copyright or something.) How much of an actual cost will become? Is this a better allocation of resources compared to establishing some digital rights? Given that companies have gone after file sharers and come up with a fistful of bad press and a negative cost: benefit ratio, there has to be a sensible middle ground. What are your thoughts? Can First Sale exist in the digital age? In the past, you’ve made statements that the publishing business model needs to change to reflect our modern technological culture. In your opinion as an author, what would the publishing industry need to do to accomplish this? I almost missed it, but I was delighted to see that he recorded a response. Take a look. With a number of issues floating around libraryland at the present moment, there has been talk in some of the my social circles about what to do about them. Specifically, how to approach tackling them as it relates to library vendors who have expressed support for legislation that has the potential to impede or block access to information (directly or as collateral damage). 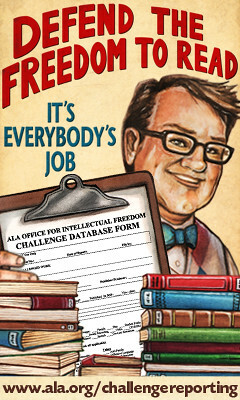 As the ALA Midwinter Meeting is just around the corner, I thought it would be a perfect opportunity for librarians to meet with company representatives to discuss their concerns about current contentious legislation (such as the Stop Online Piracy Act (SOPA) and the Research Works Act (RWA)) as well as ongoing concerns (such as library eBook lending). Lest some perseverate or advocate for delaying action, our professional conferences are the best venue to voice our concerns face-to-face for the wide array of actions that have the potential to interfere with information access and exchange. This is not the time to waiver on our values and principles. Over the last couple of days, I have examined 424* conference exhibitors to determine their support (if any) for either of these pieces of legislation. In addition, I’ve made note of any publishing companies outside of the Big Six that offer eBooks. I believe that eBooks are an essential conversation that librarians should have with smaller publishing operations and to perform inquiries as to what policies they have about library lending (if any) and how the library can work with them so as to include their content in our collections. It is in these introductory conversations that I hope can lead to better and more promising arrangements for our communities and institutions. * My list was current as of 1/3/12. They have since added 7 vendors to which I have not researched. NOTE: It should be stressed that association membership does not necessarily confer support for everything the association does. Of all people, ALA members should be able to able to understand that fine distinction. This doesn’t mean that you cannot approach these vendors about the actions being taken by their professional association. Here are some other exhibitors worth mentioning but need a little explanation. Furthermore, after seeing the list of the AAP Board of Directors, I did some deeper examinations into a few library organizations and companies. Again, I will absolutely stress that any connections do not equate to support for actions associated with the organizations nor does it mean that individuals will be able to influence policy. I am simply relating what I found because I find connections (even casual ones) interesting. ALA Treasurer James Neal is Vice President for Information Services & University Librarian for Columbia University. Columbia University Press is an AAP member. OCLC President & CEO Jay Jordan serves on the Governing Board of Publishing for the American Chemical Society, an AAP member which also has representation on their board of directors. He also serves on the University of North Carolina at Chapel Hill School of Information and Library Science (SILS) Board of Visitors; University of North Carolina Press is an AAP member. Also from OCLC, Vice President Lorcan Dempsey serves as a member of the Cambridge University Library Visiting Committee; Cambridge University Press is an AAP member. Edward Barry, Vice Chair of OCLC’s Board of Trustees, is a President Emeritus of Oxford University Press which is (as you guessed it) an AAP member. In approaching vendors to talk about this issue, I’d suggest doing some research and coming up with some talking points and questions you want to ask. 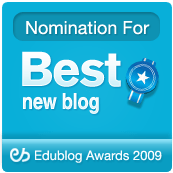 Jessamyn West has a great post about SOPA and libraries which includes links to other resources. Plagiarism Today has a wonderful blog post about avoiding the SOPA hype (both for and against) which is worth reading as well. On the more technical and legal side, the Stanford Law Review covers the nuts and bolts of what the bill would do. Eric Hellman talks about what it can mean for foreign libraries. Finally, Wikipedia General Counsel Geoff Brigham offers an excellent analysis of what the bill would do to the internet and to Wikipedia. EDIT: Springer  is actually Springer Science + Business Media, not Springer Publishing. They are supporters of Open Access. Thanks to Heather from Springer SBM for pointing out that out! I won’t have a chance to update the map, so be nice! 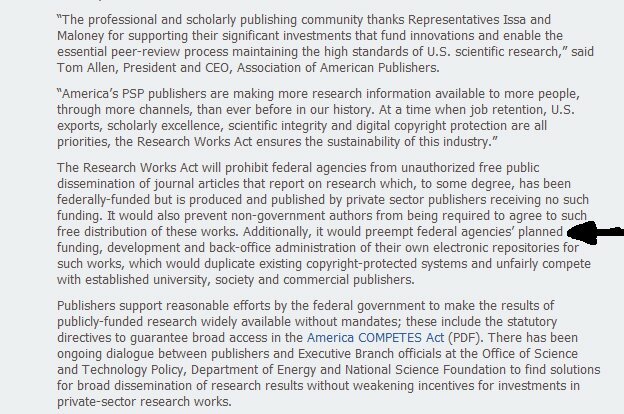 Essentially, the bill seeks to prohibit federal agencies from conditioning their grants to require that articles reporting on publicly funded research be made accessible to the public online. 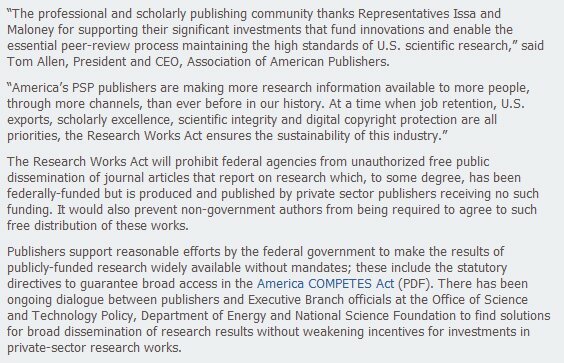 That bill would prohibit all federal agencies from putting any privately published articles into an online database, even — and this is the kicker — those articles based on research funded by the public if they have received “any value-added contribution, including peer review or editing” from a private publisher. This is a direct attack on the National Institutes of Health’s PubMed Central, the massive free online repository of articles resulting from research funded with NIH dollars. […] NIH’s public-access policy, which requires authors who receive any NIH funding to contribute their work to PubMed Central within 12 months of publication. Like SOPA, I would suggest formulating some talking points and questions before you approach any vendors that provide journal publishing and/or access. John Dupuis has an extremely thorough collection of RWA related posts that provide many different angles and opinions on the issue. There’s also a great New York Times OpEd piece that nails the issues and the concerns. These are good starting points into the creation of talking points. While you’re at it, you might want to make yourself familiar with the Open access movement in publishing. Peter Suber offers a large and comprehensive overview of Open Access which can answer a lot of questions (and possibly raise a few others). Take the time to read it over and ask vendors about how they feel about it. I felt that it is important to include a list of AAP members who will not be exhibiting at ALA Midwinter, but still stand to benefit from the RWA legislation. For those of you who are not going to the conference, consider contacting any of these vendors that you deal with in the course of your work for their stance on RWA. Another honorable mention goes to BioMed Central  and their embrace of Open Access policies. EDIT: As people in the comments have pointed out, “National Academies Press has since 1994 made all their works available for free online, and as of June 2011 now offer all their PDFs as free downloads:http://www8.nationalacademies.org/onpine/newsitem.aspx?RecordID=06022011“. They are still AAP members, but they deserve an honorable mention as well. Sorry for the mixup, but thanks for the clarification! EDIT: JSTOR & Portico  disavows the RWA, but will continue to stay with the AAP. Same for Pennsylvania State University Press. When I was examining all the exhibitors, I made a note of publishers that offer eBooks. I would encourage my fellow librarians to stop and have a chat with the people at these companies to see what their policies are, what their plans are (if any) for library lending, and how we can help them make their books available to the public while assuaging their concerns. I don’t have a listing of Overdrive’s partners or if they work with other library or library consortiums, so some of these publishers might already be working with public libraries. If so, offer them thanks on behalf of the profession for working with us to bring their content to our members. And just in case you forgot, here’s a listing of the Big Six Publishers and their respective library eBook lending policies. You may want to pay these publishers a visit as well to express your concerns about their library eBook lending practices (and, for Random House, our appreciation of their partnership). 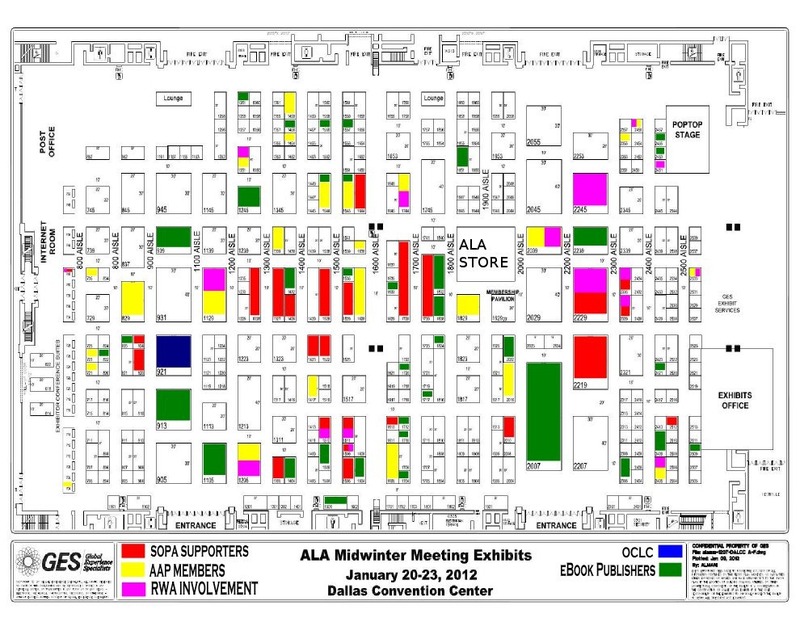 In order to make best use of your time at ALA MW and not have to go completely blind trying to mark down exhibitor numbers on your exhibit hall map, I’ve taken the liberty of creating a color coded map for ease of use. It is sized for 8”x11” landscape printing, but you can print it out in any size you need. You can also download a copy of this picture from my Flickr account. Lest people forget, we are customers to these companies. As a target consumer demographic, we do have certain economic based powers within the relationship. Personally, I’m all in favor of diplomacy in opening communications and conversations with the people who provide the content for the communities we serve. But there is and should be limits to the terms and conditions under which we will purchase or license their content for our members. Without vendors to provide content, we are limited in our offerings; but without communities to support us and trust in our business practices, we are nothing. We cannot abdicate our fiduciary responsibilities to make the best use of the resources our communities give us to spend or use on their behalf in the name of providing them with the best, latest, or greatest when the requirements for such content are unreasonable, unfair, or unsustainable. If you use this post as a guide, good luck, good judgment, and remember to be a good ambassador for the profession and your community. Here’s a district dispatch from the ALA Washington Office. Also, here’s a release from the Special Libraries Association (SLA). The Council on Library Information Resources just realized that they are AAP members, much to their own chagrin. They also added a link entitled Why AAP Supports the Research Works Act that goes into greater detail as to the reasons to support the bill. Or, rather, all of the myths (their term) around it. Dorothea Salo for her help with the Research Works Act section. The members of the Library Society of the World and their vigilance, encouragement, and help sharing and tracking down links and stories for this blog post. Their help is sprinkled throughout this blog post and would not be as robust as it is without their assistance. Many thanks for all their hard work to help this blog post come into being and the team spirit throughout. EDIT: Moved National Academy Press to the honorable mention section of the RWA portion as per feedback from comments. Thanks Monica and Barbara! EDIT: Removed Springer from the SOPA list since it’s Springer Science + Business Media and not Springer Publishing (the actual SOPA signer). Adjust your maps and lists accordingly. Thanks Heather! EDIT: Changed JSTOR and Penn State in the RWA section to reflect their stances. Many thanks to Catherine Pellegrino for tracking these announcements! EDIT: Added Aftermath section with various reactions from library entities as well as AAP changing their press release. Be sure to check out some of the other interviews on I Need a Library Job as well as some of the other people who have been interviewed on Circulating Ideas. After covering the lessons learned in 2011, I want to look ahead to 2012. In considering current trends and trying to read the library tea leaves, I opted for just a few predictions for the upcoming year. In addition, I’ve rated them in the likelihood they are to occur. #1: Here Come The Embargoes! Publishers and other content creators are looking for ways to push people towards their revenue streams (namely, to buy the book or movie). In their estimations, the only way to do this is to have later release dates for books and movies for libraries. Penguin Group has removed its newest content from the digital library shelves (with the idea of adding them back in at a later date) and Warner Brothers is delaying releases to libraries for four weeks. Given the relatively minor ripples of reaction to these moves compared to the HarperCollin’s limited 26 checkouts shitstorm, my hunch is that publishers will move towards holding back digital editions for a few weeks in order to (in their thinking) push people towards buying the book. None of the Big Six publishers have pursued a limited checkouts idea and that move is coming up on its one year anniversary. But, in holding back content for a few weeks, it will skirt the issue. Sure, libraries will get it a little later than everyone else, but they’ll still get it. While some of this is based on content being under siege from the previous prediction, I feel that it will be an impetus to revamp the form and function of the library. While it will not be the bookless library of the Cushing Academy, the shift of a physical reference collection to digital combined, the expansion of digital collections (think backlist), and pressures to demonstrate greater value to the community will take the libraries being constructed now and those being renovated to eliminate shelf space in favor of other space use. Digital creation labs, community use rooms, or even just an expansion of seating and reading areas are just a few ways that the library will be finding new uses for their current spaces. To repeat myself, I don’t think libraries will be eliminating the physical collection. I do believe that the expansion of ereaders (one in six people and growing) compared with already existing space considerations will put less physical objects on our shelves. In doing so, it will means that there will be more space for other activities and purposes. I’m mildly shocked that they didn’t get direct competition last year, but I think this year could see a viable competitor to Overdrive. Although, given the beating Overdrive took with the HarperCollins business and Amazon just about eating their lunch when it came to the Kindle lending program, I’m not too sure how eager anyone would want to be to step into the ring. However, if they can provide greater assurances for content security to the Big Six than Overdrive, than it eat Overdrive alive. This is, of course, if publishers don’t withdraw into their intellectual property fortresses and stop library lending altogether. In looking in my crystal ball this year, I didn’t have anything that really stood out. I think some things will stay the same (library association members running for office will offer platitudes how awesome libraries are and how they’d love to be their president without contrasting themselves with their opponents, people complaining about ALA and lack of jobs, and a whole lot of time will be wasted in committees, workgroups, and task forces while social politics trumps their efforts). It’s this lack of other trends that makes for few predictions when composing a list for this year. In taking a quick look as to how I did last year, I made seven predictions. I’d say I got one right (there are more paywalls to content. Thanks NYT!) and the rest were just “I’m sure it sounded good at the time, but what the hell was I thinking?” Otherwise, I recall something I read earlier last year about how predictions of pundits tend to be worse than average. It seems their ideology tends to get in the way. In keeping this in mind, I’m going to get out of the way. Any predictions you’d like to share for 2012?